JOIN SOULSPRING FOR CONSCIOUS INSIGHTS. ...on all things life, wellness, love, transformation and spirituality... PLUS! Get your FREE Guide: 12 Mindfulness Practices to Create a Peaceful Mind. Every November, I look forward to speaking at one of my favorite events, Celebrate Your Life. Year after year I have been so very blessed to be a speaker at this amazing conference and connect with people in such deep and humbling ways. It is always amazing and fulfilling. Always. This year, it was a little different. It was retreat style. Instead of being held in Phoenix, Arizona, where it usually is, it was held in Sedona, Arizona … which is one of my favorite places to visit. If you haven’t been there, it is a MUST… for sure! So, a few of weeks ago, we were blessed again to be in Sedona, Arizona … the vortex capital of the US … amazing red rock as far as the eye can see. So many canyons and cliffs and valleys to explore on foot and mountain biking … although I prefer on foot. The contrast of the rich green trees among the red rock is breathtaking. So, Kris (my amazing SOUL musician) and I, along with John Holland and Michael Beckwith had the honor of smudging the participants as they entered for the opening event that the AMAZING Denise Linn and Uqualla are hosting. We were so blessed to offer this clearing under the moonlight on the eve of the full moon. So many people with sadness in their heart but light in their eyes … coming to this event to be filled up, connected, and reminded of their value; others coming to receive support and guidance and community. Events like these are always so valuable to me, in so many ways. They fill ME UP just as much as they do the participants. We had a workshop on Friday afternoon, which was truly inspiring to hear the connections people made as they did some of our experiential exercises. The tears tell the story oftentimes, but man I do love to hear the stories of complete strangers feeling unconditional love in the hearts in a matter of 4 minutes. Friday night, we had a beautiful dinner and story time with Denise Linn. She shared a great story, and she had so many fun and AWESOME stories that I don’t recall which one specifically, but after it she suggested that everyone pay attention to the signs that Spirit is leaving for us. She gave the example of a white feather. Suggesting to the audience of 350 people that Spirit would show up in the form of signs and perhaps one sign might be a feather. The audience loved her stories. I simply LOVE her! So, Saturday rolls around, and we are so excited to journey with a group of people to one of my favorite places in Sedona, Buddha Beach at Red Rock Crossing. We are blessed to board the buses with so many people excited to see Oak Creek for the first time, the most perfect view of Cathedral Rock there is, and to experience an invocation with the angels and a cairn building opportunity. During those quiet moments, I felt called to invoke the archangels. So, as my group sat in silence, I invited the archangels into our space, asking them to allow each person the perfect experience for their highest good. As the group meditated, I took a deep breath, and looked up. This is what I saw. A PERFECT FEATHER in the SKY! At the same time that I saw it, a woman in our group looked up and saw it too. I quickly brought everyone back to present moment and asked them to gently look up. 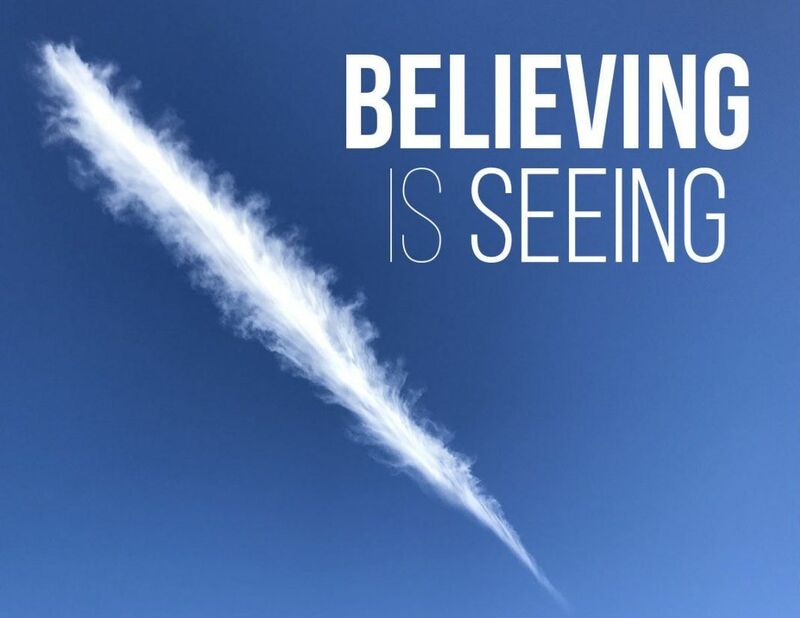 Everyone was in awe as they pointed out to each other the miracle in the sky, all of us also remembering what Denise had suggested … that Spirit would show us a sign, in the form of a feather! You see … Seeing isn’t believing. Not in my world anyway. I see many things that others don’t see. and Oh, my friend, the things you will see. If you only believe! Sunny Dawn Johnston is an author, inspirational speaker, spiritual activist & teacher as well as a psychic medium. Over the last sixteen years, Sunny has performed thousands of private sessions, readings and workshops which have helped people connect with their heart and release the things that hold them back from being their greatest version of themselves. Combining the unconditional love of a mother and the tell-it-like-it-is honesty of a best friend, Sunny helps people move into a higher vibration of living … and a higher vibration of Being. Using her spiritual and intuitive gifts, she shines a light on the areas of lack, fear, insecurity and sometimes … B***S***! Having walked a challenging life journey herself, Sunny knows from experience, both personally and professionally, that at the heart of these issues is a lack of Self-Love. By reflecting the true nature of her clients back to them – which IS Love – they can experience, and then allow in that unconditional love, and begin to heal themselves. How do you free up your consciousness for people who are suffering? What does it mean to see God in everyone? Will Your Relationships with Others Create Unity or Isolation? How can we bring awareness into parental relationships?